Creating your own DIY wedding centerpieces is a great way to save some money and have lots of fun creating your own unique table settings. Your wedding centerpieces are what make your wedding reception personal, they add style and color to your venue and set the scene for your special day. But where do you start, there are so many things you can do to create your own centerpieces. Here are five great starting points that should help you. You can follow my step-by-step tutorials to create yours or just takes theses ideas as initially starting points and let your creative energy develop them into your own unique designs. My top tip would be to keep it simple, don’t go trying to create some enormous flower centerpiece that you’ve seen made by a trained florist. Not only will you find it hard to do, you’ll also end up giving yourself too much work to do on the morning. Floating or submerged flowers of all one type look very effective and can really add the WOW factor to your tables. They are also quick and easy to put together on the morning. 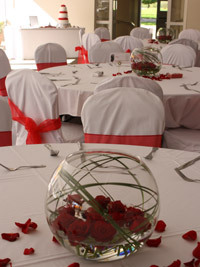 You can see how I used floating red roses to create these centerpieces in the photo above. Simple seasonal flowers or plant centrepieces can look really effective, particularly if you choose blooms that fit in with your color theme. Here is a step-by-step tutorial on how to create a tropical flower centerpiece. It uses very few flowers, but the flowers I’ve chosen are stunning so you don’t need to use many, this will really help if your on a budget. If you would prefer to make your centerpieces earlier on in the week of your wedding think about using plants. 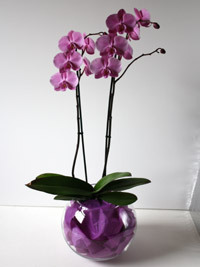 You can see here (photo left) how I have placed a beautiful pink phalaenopsis orchid plant into a large goldfish bowl. The lovely thing about plant centerpieces is you can give them away to guests at the end of the evening. If you would like to create these orchid plant wedding centerpieces for your wedding then just follow my step by step tutorial. You might want to think about theaming your wedding centerpiece around the season of your wedding. For instance if you are getting married in the fall you might want to think about using gauds and pumpkins in your wedding centerpieces. You could simply place a collection of interesting small gauds, pretty dried leaves and physalis lanterns into large glass vases. In the photo on the left you can see an example that I recently made. Are you getting married in December or over the Christmas holiday season? 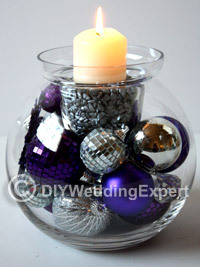 Why not incorporate coloured baubles to match your wedding color theme into your centerpieces. Check out my step-by-step Christmas centerpiece tutorial. If like me you are getting married in the spring you could use planted bulbs like tete a tete, muscari or crocuses arranged in decorative plant pots. If you are planting your own you could plant them into interesting containers like large cups and saucers, teapots, picnic baskets etc. Do you have a strong wedding theme? If you do, why not think about making your centerpieces to fit with your theme. For a beach wedding theme you could fill the bottom of large hurricane lamp vases with sand and place decorative shells around a central candle. Another great idea is to have a large shallow glass bowl that you can float tropical flower heads (such as orchids) and floating candles. Butterfly wedding theme, place a selection of interesting branches into a decorative vase or container and attach pretty butterflies onto and hanging from the branches. 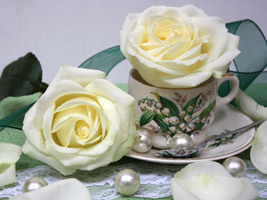 For a vintage wedding theme you could collect or hire old decorative crockery and place a selection of items onto a mirror adding rose heads into the tea cups and scattering pearls and placing lace into the arrangement. You can see one here (photo left) that I created for a recent wedding. If you’re having a western wedding theme why not think about using colourful miniature cactus arranged in decorative plant posts or mini tin buckets. Candy bars have become really popular for weddings. I think this is because it reminds everyone of being a bit of a kid and gives us a nostalgic memory of our child hood. But why not use this idea for your DIY wedding centerpieces. You could buy decorative glass vases such as goldfish bowls, cone vases or apothecary and mason jars and fill them with candy. You could choose candy in your wedding color theme or chose a different candy for each table. This would give your tables a unique theme that you could use on your table planner as you could name your tables by the candy i.e. the ‘lemon sherbet’ table, the ‘caramel’ table etc. Candles give you a touch of romance, they work for weddings at all times of the year, as there is just something so simple and romantic about the flickering flame. They are a great starting point for creating DIY wedding centerpieces. 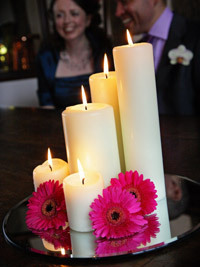 You can simply place a large chapel candle onto a circular mirror and scatter colourful flower heads (see photo on the left) or petals around it. 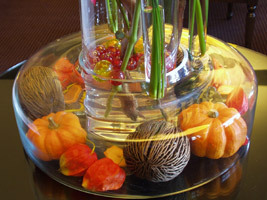 You can add decorative fruits for a tropical or summer wedding and gauds and decorative leaves for a fall wedding. Tall or low vases can also be used with floating candles just make sure you use vases that are heat resistant. A large flat glass bowl filled with coloured rose petals and floating candles can be so simple but so effective especially as the evening draws in. I hope that gives you just a few ideas as you start to plan your own unique DIY wedding centerpieces. Just don’t forget to have a trial run before you buy all your materials so that you know it’s going to be exactly what you want and don’t forget to enjoy creating them, as I’m sure your guests will appreciate your work. Here are some more DIY wedding centerpiece ideas. Return to DIY weddings homepage.